Like many consumer electronics purchases, an A/V receiver is a significant investment. Not only will you probably be spending at least $600 on one, but it will have a large effect on how the audio coming from your speakers sounds. In short, anything you run through your A/V receiver will only sound as good as the level of quality that it can support. So when you are shopping for a receiver, how can you tell which models are up to the task of giving you the top notch performance you need? Read on and we’ll break down the ins and outs of receiver comparison. This is a huge topic, so for the purposes of this article, we are just going to focus on comparing A/V receiver power. We’ll run through a few key things to look for as you compare the power of different models, as well as identifying some of the tricks that manufacturers use to inflate their specs. It sounds simple, but it’s true, one easy to way to identify if a receiver has a quality power supply and transformer is to look at the weight of the unit. Cheaper power supplies and transformers and their associated components will be smaller and more light weight. One caveat though, this applies to comparing receivers with traditional A/B amps. Receivers that use class D amps will be lighter as the digital technology they employ does not need the larger transformer and heat sinks of an A/B amp. Take a look at the Yamaha RX-V585. It’s a lower end model and will only set you back a modest $499. The weight is listed at 17.9 lbs, which is pretty light for an A/V receiver. By contrast, the Onkyo TX-NR585, which is in a similar price range and lists comparable specs, comes in at 20.7 lbs, almost three pounds heavier. Even though they are both listed at 80 watts/channel, my money would be on the Onkyo to actually deliver more power in a real world situation because it’s likely to use higher quality components. Sure, this is conjecture, but it’s worth noting that Onkyos are fairly legendary in terms of their bang for the buck and the power they provide. The reputation of the lower Yamaha models are a bit more mixed with a lot of their accolades being based on features and video performance rather than power. Speaking of power, let’s take a look at what you need to pay attention to when comparing specs. Let’s look at the spec page for another receiver, the Pioneer Elite VSX-LX102 and look at the power specs right at the top on the left hand side. Notice how there are actually two specs listed, 170 W/ch (6 ohms, 1 kHz, THD 10 %, 1ch Driven) and then 80 W/ch (8 ohms, 20 Hz-20 kHz, THD 0.08 %, 2ch Driven, FTC). Pretty big difference there with one spec listing 170 watts/channel and then another showing only 80 watts/channel. So which power spec is correct? Well this where things get a bit tricky, because technically both specs are valid, but in the case of the 170 watts/channel number, it relies on very specific conditions that are highly unlikely to really happen. In order to actually get 170 watts out of this receiver, you’ll need to only be driving a single channel, that is only one speaker, and that speaker will need to be rated at 6 ohms and also will need to be to be only producing a 1 kHz tone. When will a speaker be producing just a 1 kHz tone? Only if you are running a test tone at that specific frequency, for all intents and purposes a speaker will never be producing only a single frequency during actual use. Oh and by the way, the Total Harmonic Distortion (THD) will be 10%, which means you’ll have cranked the volume to the point where your speaker is producing tons of noise and basically sounds terrible. So as you can see, that spec is there merely to make the receiver look like it will provide more power than it really will under normal conditions. Now just about every receiver manufacturer does this, in fact if you look at the Onkyo TX-NR 585 page you can see the same thing, so Pioneer is far from the only guilty party here. In fact, things have gotten better in recent years, it used to be that for some models they would only give you this inflated spec and not even bother with the more realistic version that the second one represents. Let’s go through that second spec to see what it tells us about the power. The 80 watts/channel spec is a much better indication of the power that the receiver will actually deliver. First off, it’s connected to an 8 ohm speaker, which will draw less power. Second, it’s when a full band signal is being produced, all the way from 20Hz-20KHz, which is the typical range of most music. Third, that THD spec which measures distortion is at .08%. Higher end receivers can get you an even lower THD rating, with some even down to .01%, but for a model in the $500 range this is acceptable. Finally, in this case the receiver is driving two channels instead of one. Now here we run into a little bit of fudging as for movies it is very common for five or even seven channels to be putting out sound at once, but at least we can rely on this spec for the power output for two channel music listening. Just keep in mind, when you are watching a movie you’re going to get less power from the receiver, a good bet would be in the vicinity of 60 watts/channel for this model. The best way to find out what kind of juice you are going to get from a receiver is to try and find a review where they have put the receiver through a bench test and measured it’s actual power output. One publication that regularly includes a bench test is Sound & Vision. If you are looking at models definitely check their reviews first to see if they’ve put a particular receiver through the paces. As an example, their most recent review is the NAD T 758 V3 and here is their bench test or as they call it, the test bench, tomato, tomahto I suppose. The NAD T 758 V3 is a fairly high end unit and priced at $1300, so we should expect it to test quite well and get reasonably close to their stated specs. Looking at Sound & Vision’s test, it came in at 100 watts/channel with two channels driven at 8 ohms with .1% THD. Over on the NAD site, they claim 110 watts with two channels driven within “rated distortion”. The “rated distortion” is fairly vague and could mean practically anything, but if we look lower we see that they are advertising a THD of .08%. So they are being a little dishonest, as according to the bench test at .08% THD, the power output would in fact be lower than 100 watts/channel. One nice thing that NAD does give you is a “full disclosure” power rating which is all channels driven, full range signal at .05% THD, which is quite low. This rating is 60 watts/channel according to NAD. However Sound & Vision found that there was an output of 66 watts/channel with all channels driven but with a THD of .1%. There may be some fudging going on here too, but it’s probably only on the order of about 5 watts or so. Overall, if we just look at the bench test, 66 watts/channel with a .1% THD with all channels driven is a pretty good level of performance and again, not too far off from what NAD states. As you can see, finding a bench test for a model you are interested in is an extremely valuable evaluation tool. If you are in the market for a high end receiver, there are a couple things to look to ensure you are getting a high quality amplifier design. One is a toroidal transformer, which is a transformer that is in a ring or donut shape, that’s right donuts aren’t just for breakfast anymore! But seriously, because the donut shape is symmetrical it minimizes magnetic leakage from the transformer and also reduces electromagnetic interference to neighboring circuits. Essentially, it allows for less noise to be introduced by the transformer to the rest of the amplifier. Toroidal transformers are also more efficient, meaning that more power makes it to your speakers rather than getting lost to leakage. 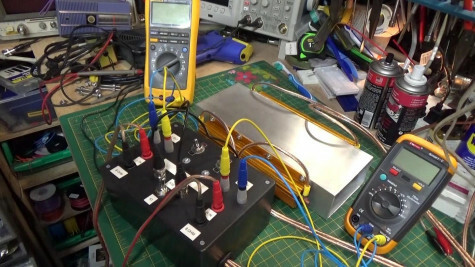 Now you aren’t going to see a toroidal transformer in most receivers under $3000 as they are the hallmark of a higher end design. A couple of examples of receivers that use toroidal tranformers are the Marantz SR8012 and the Anthem MRX 1120. Another feature of a quality receiver is discrete amplification. In many lower end receivers the amplifiers for each channel can share circuitry. In a receiver with fully discrete amplifiers, each channel will have it’s own circuitry as opposed to an IC that incorporates all of the amplifiers into a single board. This reduces crosstalk between the channels which is another form of interference that can result in distortion. 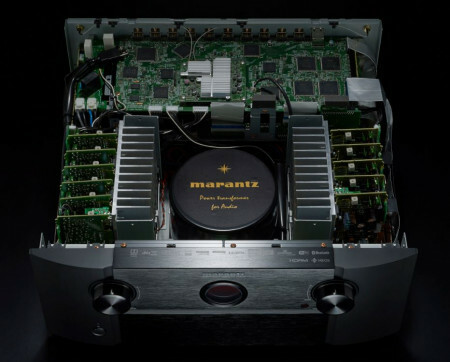 Marantz are famous for their discrete amplifier designs and even offer it in the relatively reasonably priced SR5012 model which sells for $999. That wraps up our look at comparing A/V receiver power, now that you know what to look for, you can make an informed buying decision the next time you’re in the market to upgrade this crucial part of your home theater. We hope you enjoyed it and as always, happy listening! Editor’s note: An earlier version of this article compared the weight of the Pioneer VSX LX102 to the Onkyo TX-NR585. As the Pioneer LX102 is a class D type amp and the Onkyo is an A/B type, the article has since been updated.